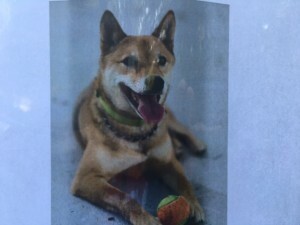 Someone who lives close to University Estates lost their dog “Wasabi” last night. He’s a three year old, very friendly, Shiba Inu. He weights around 22 lbs and was actually spotted on MLK a couple of hours ago. 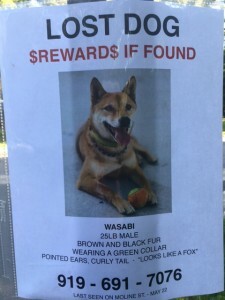 A picture of Wasabi is attached and he is wearing the same green collar as in the picture. Is there somewhere we can see the photo? It’s not showing in this post. I would cross-post to my Facebook feed if I had a photo. I noticed the Lost Dog signs during my run yesterday. I took pictures of the sign this morning and have added them to the post.